The first issue of Ron Marz and Kenneth Rocafort’s Velocity miniseries delivers an effective blend of action and exposition. Appropriately for a book about a speedster, it hits the ground running, and while the main conflict doesn’t really begin until the end of the issue, there’s plenty going on in the opening chapter. The setup for “Decoys” is simple: A mad scientist infects Velocity and her teammates with a virus that will kill them within an hour, and she’s the only one who might be able to stop it. 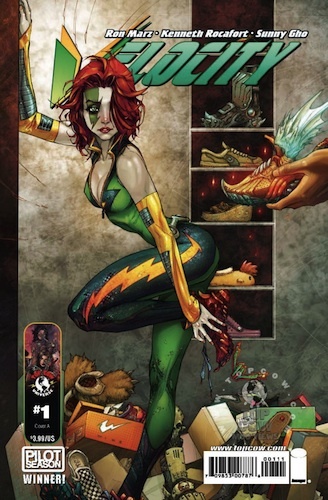 A bit of background for those not familiar with Top Cow’s resident speedster: Carin Taylor is a member of Cyberforce, a team made up of former (unwilling) test subjects of Cyberdata. Cybernetic implants give her super-speed, and a layer of Kevlar under her skin gives her some degree of invulnerability. The comic is actually quite new-reader friendly. You get a good sense of Velocity’s personality (snarky, tends to get ahead of herself), powers (runs fast, jumps fast, dismantles killer cyborgs fast…but vibrating through walls and into other dimensions is right out), and the basics of her origin. The villain’s motives are established clearly. There’s even a page in the back with short profiles of Velocity and her teammates. As someone who has read only a handful of Top Cow books, there was only one point where I felt like I was missing something critical. There was an editorial note attached to it, but it only identified the comic book and issue number in which the event happened, not what it actually was. The villain himself is pretty much standard-issue mad scientist with a grudge. He blames Cyberdata for the tragedy resulting from his own mistakes, and is taking his revenge on those who benefited from his misfortune: the enhanced humans who became Cyberforce. I will give him props for putting his plan in motion before monologuing, though…and sticking around to watch the deathtrap in action. Kenneth Rocafort’s art is very good incredible, though occasionally it shifts distractingly into cheesecake mode. Unfortunately, this includes the covers (where she’s missing the personality that she has in the interior art), which means I’m not likely to be reading this book in public anytime soon. 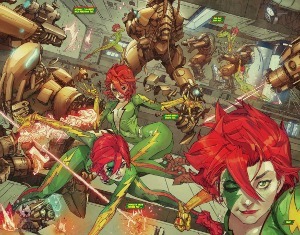 Admittedly, by Top Cow standards it’s relatively tame…though I have to assume that Velocity’s new costume is glued on. It’s the only way it could stay in place. I do miss the craziness of the 2007 Pilot Season one-shot that led to this series. With Joe Casey writing, there was a sense that anything could happen, and Kevin Maguire really sold that. This is shaping up to be a more conventional super-hero story, which is perfectly fine, but a big change in tone from the book that people voted for three years ago. 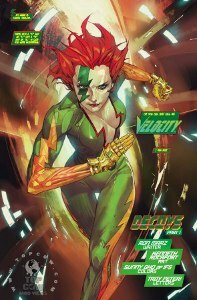 Velocity #1 (of 4) arrives in stores June 30. This entry was posted in Other Speedsters, Reviews and tagged Decoys, Kenneth Rocafort, Ron Marz, Velocity on June 27, 2010 by Kelson.